In the midst of a $53 million addition to the Mechanical Engineering building on the Purdue University campus, it was discovered that a 15 foot deep 12” clay sewer lateral that serviced the building had a collapsed section of pipe. “Due to the nature of the break, lining was not an option,” said Brad Rynearson, Project Supervisor with TPI Utility Construction (TPI). With project phases being held up by this break, and students roaming the campus, the pipe had to be replaced promptly, safely and most of all, within budget. “The lateral was only 75 feet long, but because of the depth, the shoring alone was estimated at more than $50,000 if the job had been open cut,” said Rynearson, “This quickly moved the mood toward a different solution.” There were only two methods that were possible on this job site, open cut and pipe bursting. It became painfully obvious that open cut replacement of 75 feet of pipe was an expensive proposition. 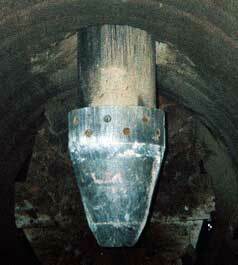 For more than 20 years, the Pipe Bursting method has experienced exceptional growth in use worldwide. Developed by British Gas, Pipe Bursting is a method where the existing pipe is fractured by applying outward pressure inside the pipe, expanding the annulus and pushing the cracked pipe into the surrounding soil while at the same time pulling in new pipe. This technology was born out of the necessity in the United Kingdom (UK) to replace aged gas mains in inner cities and neighborhoods where building and traffic congestion made open cut replacement logistically difficult and cost prohibitive. Over time, the method was adapted by to the water and sewer industries to replace mains as old if not older than the gas mains being replaced. The potential impact on social, financial and safety issues were major factors in deciding to use the pipe bursting method. “A Pipe Bursting job is usually considered high profile when it contains long replacement lengths, large diameter pipe or multiple up-sizes,” said Nate Hrabosky, Midwest Territory Manager at HammerHead. 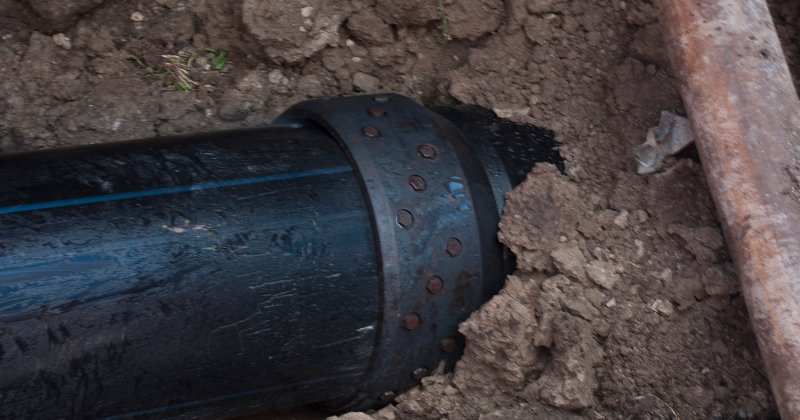 “Vary rarely is a 65 foot, 12 on 12 sewer main pipe burst considered a high profile job”. However, the job completed at Purdue University, home of the Boilermakers, is a notable exception.” According to Rynearson, Purdue University saved an estimated 75% over open cut costs and the job was completed in three days versus three weeks. “cost and savings and reduced disruption make this a high profile job,” said Hrabosky. “I contacted Gary Nirich from the local HammerHead dealer in Indiana. He was instrumental in assisting TPI with equipment selection,” said Rynearson. “After a short meeting, we decided that the best equipment for this particular job was to use an 8” HammerHead Mole® pipe bursting tool, 12” burst head and the HydroGuide® HG12 winch.” By using an 8” tool with 12” bursting head they were able to utilize the Earth Tool Company patented manhole exit method which saved an excavation. The most challenging aspects of this project were the tight working spaces and assuring the safety of the students walking the grounds. “The pipe and the equipment had to be craned in and out to even get to site,” said Rynearson. It was important to execute the job quickly as the University was not too keen about having a 15 foot deep hole in close proximity to the student’s walking path. “Having the proper equipment helped us execute the project quickly,” said Rynearson. 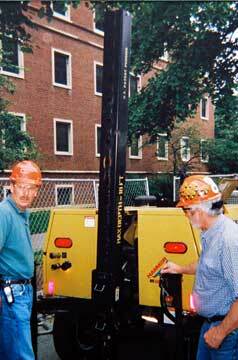 The HydroGuide HG12 winch has a hydraulic deployable boom that only took 15 minutes to setup. After that, it was only another 20 minutes of actual pipe bursting time to get the 65 feet of pipe in the ground. HammerHead® pneumatic pipe-bursting systems are being used by underground contractors around the world.